Gypsy: “nomadic and itinerant; inclination to move from place to place.” This is how I can best describe one of my coyote families that has lived in a series of small parks or open spaces in the city. The other families in the city which I know — and I’ve been following 9 of these more than a dozen families in the city — stick to their territories and the closer neighborhoods, including one loner who at the age of 3 and a half still lives happily alone on her little plot of land. They seem to all have claimed their land permanently. On these territories (except where the loner lives), pups are born yearly and disperse usually between 9 months and 2 and a half years of age, sometimes leaving of their own accord, and sometimes being driven off. When they disperse, of course, they move out and away from their territories for good, as far south of the city as Los Gatos, as discovered by Jonathan Young. Many of those dispersing coyotes get hit by cars. Each family is different in how the youngsters flow through, but what is the same in all except my gypsy family is that the breeding pair have remained on their same land for years and years, and outsider coyotes are driven off. This is not true of the gypsy family. This schematic diagram to the right represents a distribution of claimed coyote territories where the same families — as I’ve observed them — have lived for years (the green areas) within the mass of the city surrounding them: streets with incessant traffic, noise and activity, homes, business centers. And my one nomadic gypsy family whose movements have carried them to five different locations (the red starred areas) within the last several years. The movements appear to be associated with pupping. I’ve known this gypsy family for only several years — through the births of two litters. When I first encountered them, they were new to the park, so they had been moving around before this time OR they could have been two of the lucky dispersing coyotes from other parks in the city to find an empty niche within the city: the male soon became omnipresent and readily visible in his small park (Park A) while the female remained much less conspicuous. Then, I noticed this same female on a street, heading towards another park (Park B), which surprised me greatly. I observed her enter the park and saunter through. I wondered if she would have been driven out, as others had, had she been seen by the resident coyotes who have not let any non-family coyotes into their park. I wondered what her connection to this Park B was, because surely there was one. Again, two months later, for a period of several weeks, I found her traversing the same street route regularly at about 7 to 10 am between her original park (Park A) and this second park (Park B), AND she obviously was lactating during that time. Her mate never made these treks with or without her. So the plot thickened and so did my questions. Why was she moving between two parks, the second of which was already occupied by another stable and entrenched coyote family? Had she had her youngsters in that park? Was it safer for pups there? Was there more food? Was she keeping the pups away from her mate? OR, were the pups actually at Park A, in which case she would have been just visiting? But why? Soon, all this park-hopping stopped: it turned out to be a temporary situation, because after lactation ceased in June, she again kept to her original park (Park A) and the youngsters, two of them, were seen there sporadically. So I didn’t pursue my questions any further. Life became routine at that park (Park A), with Dad making his reconnaissance rounds daily, hanging out in his favorite spots between daytime napping sessions, and finally meeting Mom in the evenings as dusk fell for their rendezvous during which they romped together joyfully. The youngsters would join them afterwards for jollity and play. It was always dark by that time and one could only become aware of them with a sweep of a flashlight if they were in the right place at the right time: their reflecting eyes could be seen racing this way and that. Very few people ever saw these pups. This family, during this time, appeared no different from any of the other families I watched. Then, at the beginning of the next breeding season, in early 2018, both parent coyotes disappeared from their park (Park A), even though their yearlings remained there. The yearlings now took over the daily rounds there during the night. Had that park (Park A) now been ceded to them, I wondered? Soon I discovered the new whereabouts of the parents: they were in another very small open space (Park C) about two miles away. The male’s appearance here was shockingly decrepit and sad, with new and prominent scars covering his face, an extremely forlorn demeanor, and a perpetual slinking stance. Had he had to fight for his mate? I don’t know. We have one photo of another male in the area. It was still February and it was mating season. Although coyotes mate for life, I asked myself if there might have been some kind of a showdown? Our male was observed at this park (C) for only a couple of weeks before moving on — the female was seen even less — and then they disappeared from this site as well and I lost track of them for a few weeks. The next thing I knew, the pair had settled into yet another area (#D), about a mile away, where pups were obviously born — it was obvious because Mom was lactating again. This coyote pair has remained in this area (#D) now for over four months with their growing pups. The male performs his territorial sentry/reconnaissance duty several times a day as any good guardian father would, and in the evening he meets up with his mate for lots of fun and play without the youngsters, and the youngsters join them later. However, a month ago Dad started returning to his original park (#A) for one-day long visits, always traveling to and from there at night, and always returning to the park where he had his last litter of pups (#C) the next evening. Those visits have become regular, occurring, to begin with, every 2 weeks, and now every week or less, and they’ve grown from one-day visits to 2 and then 3 days in length. During the visit yesterday, BOTH parents traveled the streets at night to the original park (#A) where they remained all day, leaving this year’s pups at the only home they have known so far (#C), and returning to them that evening. During today’s visit, only Mom made the trip for part of the day and returned before evening — walking the streets of San Francisco during daylight. And there’s actually a 4th park involved (Park E), where several of us watched the female attempt to stake out yet another park for almost a week before returning to park #A after her first litter had been born. This park was clearly inappropriately too small for her needs. This is a developing story, so there’s sure to be a sequel at some point. Wow! This is very interesting! Does the male look less decrepit these days? I’m curious whether he has perked up now that he has another successful litter of pups and is mostly living at Park #C. Thanks for this interesting saga! Once again, Janet, thank you for your powerful observations. As a coyote enthusiast, I keep learning from your posts. 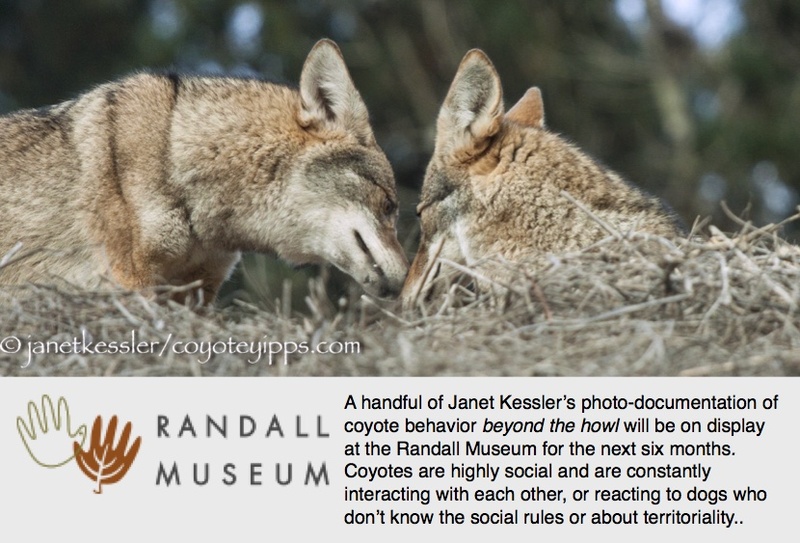 Your intimate observations of real coyote life is EPIC!!!! I love it so much. Thank you.